What is a Gyros Anyways! You may not know how to pronounce it and you may have to find it off the beaten track, but anyone who has tried a Gyros (yeer-ro) at Yummies & Gyros cafe knows it is worth the effort. Still somewhat of a novelty on the west coast, though extremely popular back east Canada, in Europe, Mexico and throughout the world, the basic idea has many names: Slovaki, Turkish Kabob and Donair. It starts as a cone of meat cooked on a horizontal rotisserie spit, the meat which could be lamb, chicken pork or beef or a combination, where the cooked outside layer is shaved off as thin slices or meat and laid on a 7" fluffy pita bread topped with fresh vegetables and Tzatziki Sauce or to make a donair you top it with the popular tasty Sweet Sauce. Gyros & Donairs are made fresh as you order them so you can customize them according to your own taste. 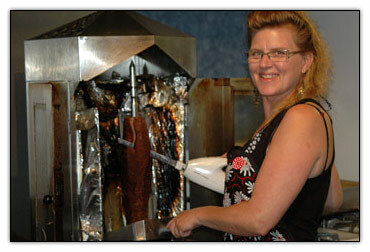 The most frequently asked question is - "What is the difference between a Gyros and a Donair?" At Yummies & Gyros, a Gyros has Tzatziki sauce on it which consists of sour cream, yogurt, and garlic. While a Donair has Sweet Sauce on it consisting of condensed milk, sugar and garlic, Topping of both consist of lettuce, tomatoes, and onions or as an extra you can add feta cheese or hommus. You can also buy all the ingredients separately in quantities and take them home to prepare yourself. Perfect for picnics, camping or boat trips or just a late night dinner or snack in the comfort of you cozy home. Don't worry if you are lactose intolerant or have allergies we can work around those.